killer evidently isn’t playing by those rules. What the blurb above does not say is that the main reason this novel was “consigned to her bottom drawer” was that the author’s usual publisher rejected this offering in the 1950s because of negative reviews by three of their pre-publishing readers. I can understand what attracted scathing comments from these readers. First of all I think Wright meant this as a spoof on the genre. The murder victim is a publisher known for his scathing comments about would-be authors and the books they gave him to read, but also an unlikeable person who tried his invective out on most of those who came within range. The amateur sleuth who thinks the murder is not accidental is his nephew, but he didn’t like Athol Sefton any more than most people. He just thinks the local doctor and policeman are bumbling idiots. Enter an odd plot strand – the victim himself was under observation by the Victoria police for the murder of his wife, actually a cold case, with the second suspect being the nephew who used to send her boxes of chocolates. 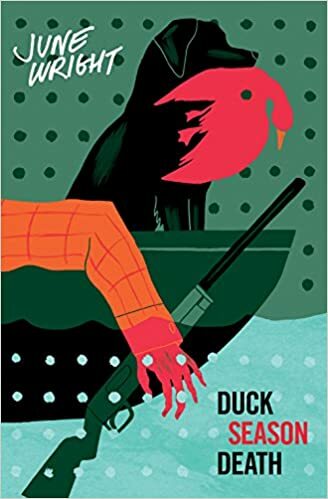 So there we have it – a country house murder set in the style of Agatha Christie (to whom there is the odd reference), located in rural Victoria in the 1950s. The location is near the Murray River at a hotel called The Duck and Dog Inn. The timing: the opening of theduck shooting season. I spent some time considering whether I thought Wright intended this as a spoof or not, and therefore how I should rate it. I think she did, but her original readers misunderstood, or disapproved. Other bits of humour emerge, even a romantic element. So it may well have been “ahead of its time”, but she doesn’t quite pull it off.